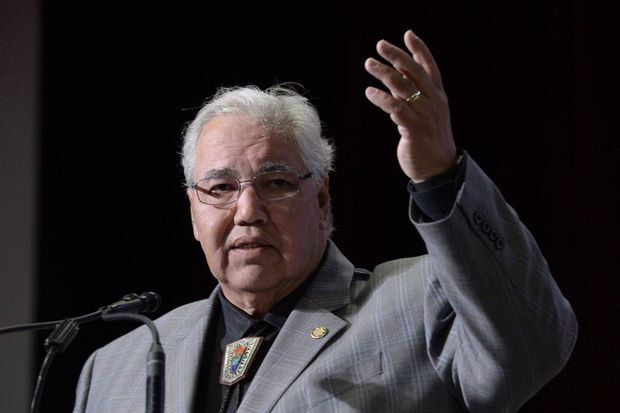 Senator Murray Sinclair says if the child-welfare system existed in its current form when he was a boy, he would have been cut off from his family and cultural heritage. The chairman of the Truth and Reconciliation Commission on residential schools and Manitoba’s first Indigenous judge was raised by his grandparents just outside Winnipeg. “We would have been apprehended by the child-welfare system if it had been organized as it is today,” he told social workers, bureaucrats and academics at a national child welfare conference Friday. In this 2015 file photo, Commission chairman Justice Murray Sinclair raises his arm asking residential school survivors to stand at the Truth and Reconciliation Commission in Ottawa. He said his grandparents would have been deemed too old to have cared for him, had today’s rules applied. Their house didn’t have electricity or running water and was crowded. “We sometimes didn’t have enough to eat. We barely had enough wood in the winter time to keep the place warm, but we managed,” he said. Sinclair said there are more children in Canada’s child-welfare system today than there were at the height of residential schools, which housed Indigenous children forcibly taken from their communities in what the Truth and Reconciliation Commission said amounted to cultural genocide. Sinclair’s home province of Manitoba has the highest per-capita rate of children in care in the country. As of March 31, there were more than 10,300 kids in care – almost 90 per cent Indigenous. Sinclair said some children may flourish in non-Indigenous foster families, but the vast majority have been failed because they have been cut off from their family traditions. Sinclair said most social workers want to do good, but must acknowledge they are working in a system that hurts Indigenous children. “They have to … be willing to stick their necks out a bit and do what is the right thing within the rules they’re bound by, instead of defaulting to a view that is founded on principles of racism that go back 150 years,” he said in an interview. Not enough has been done to recruit Indigenous people into decision-making roles and nearly two-thirds of the urban population have been ill-served by reserve-run child-welfare agencies, he added. Monty Montgomery, a University of Regina social work professor with 25 years experience in Indigenous child welfare, said training and resources for First-Nations-run welfare organizations are slowly improving. Alex Scheiber, who chairs a committee of provincial and territorial child-welfare leaders, said tinkering with the system isn’t good enough. Simply adding more Indigenous social workers and policy-makers won’t suffice. “There’s a reason why it’s hard to retain and attract Indigenous people. We’re asking them to come and work in a system that is failing their people,” he said. Scheiber said he’s encouraged by steps taken by his home province of British Columbia to shift more decision-making to First Nations. And he believes there’s reason for optimism. “I have had the feeling over the last 18 months that we are on the brink of the biggest change in child welfare in Canadian history,” he said.